It seems only right and proper to begin this pair of reviews by revealing that I am not generally a fantasy lover. On that note, I can say that venturing into the respective otherworlds of The Girl at Midnight by Melissa Grey and Carry On by Rainbow Rowell was surprisingly delightful. Both stories were set on a present-day Earth with magical realms hidden in plain sight. Both spent their plots following a chosen one protagonist as they navigated their destined path via alternating points of view. Both protagonists, Echo in The Girl at Midnight and Simon in Carry On, were born into normalcy, orphaned, and adopted by a sage authority figure (the Ala for Echo, and the Mage for Simon). Both have a prophesied mission to save themselves and their realms, both have to discover and harness their power and prove themselves worthy of their ultimate cause, and both have fierce friends and meet ferocious obstacles along their journey. Both stories feature romances of the heterosexual, homosexual, and inter-magical-beings variety. The Girl at Midnight is Grey’s debut novel brings a young girl, Echo, who ran away from an abusive home life into the magical realm of the Avicen, a race of magical, feathered people who are at war with the Darkharin, a dragon race with magic of their own. In filching a music box for her adoptive mentor, the Ala, as a birthday gift, Echo sets off a domino effect wherein she must find a possibly mythical creature called the Firebird, the only thing that can end the war between the battling races. During this epic scavenger hunt, Echo’s sense of loyalty and belonging with the Avicen is put to the limits when she accidentally allies with the Darkharin prince, whose ultimate goal is the same as hers: everlasting peace. The door for a sequel is left wide open. Carry On comes to us via Rowell’s previous YA work, Fangirl. In Fangirl, Cath, a college student, writes slash fanfiction for a fictional, Harry-Potter-inspired book series whose latest installment has yet to reach eager readers’ hands. “Carry On” is the title of Cath’s fanfiction, but Carry On by Rainbow Rowell is professed to be a different story entirely despite sharing a title. In this rendition of Carry On, despite being raised amongst the Normals, Simon has been prophesized to be the most powerful Mage in the world, the only one powerful enough to end the terror reign of the Insidious Humdrum. As the first Normal to enter the Watford School of Magicks, his presence isn’t always welcome especially by Old Families like his sworn enemy and roommate, Baz’s. However, circumstances bring the unlikely pair (as well as Simon’s friend Penny, and sort-of-girlfriend, Agatha) together to overcome the source of their magickal despair. Remember in the beginning when I didn’t read fantasy? The Girl at Midnight presented the exact conundrum I have with the genre. While its present action sucked me in and did not let me go until the end, I was left with lingering questions about the magic, the history of the war, and many other tidbits that could have easily been made clear without sequels. While Carry On also left some magickal questions unanswered, the fact that it is the answer to a fictional fan fiction (and ostensibly the last installment in a series) based on a more widely known and much beloved (by me) fantasy left me feeling very at ease with many of the loose strings. And so I see this round of the battle not as two fantasies with big similarities and bigger differences, but as a debut fantasy versus a veteran meta-commentary on fantasies. And, as the reader who does not easily take to fantasies, you may have already prophesied this round’s chosen one. In Court of Fives by Kate Elliot, Jessamy wants nothing more than to participate in the Game of Fives which includes rigorous obstacle courses. Some of the paths can be deadly if you don’t make sure you have your footing right. Much to her dismay, there is no way that her father would ever let her participate in the trials but Jessamy has no intention of following his orders. On the day Jessamy is to participate, her father comes home from war as a hero and she is torn between trying to be the dutiful daughter or following her heart and participating in the Fives. What happens next is a complete undoing of the world she has come to know. Not only will she meet someone during the game who will play an intricate role in her future, but her whole family will be torn apart all to serve another man’s greed for power. This book has a older world feel to it that would perhaps be best compared to early Paris or Rome. Wars constant and men are judged by their valor and how many sons they have. There is also a very firm hierarchy of classes and a firm belief in folklore which is passed down through the generations. The book is a page-turner but there are times when the story slows down or goes too much into the historical that I did feel a little disinterested though these were few and far between. Overall I would say this is a book I would recommend to fans of dystopian or historical fiction of this time period. An Ember in the Ashes by Sabaa Tahir contains a world that works like a Roman Empire which is filled with nothing but danger for all. Two individuals from opposite worlds, but share a common view for their own future, just might have the courage to break the bonds that chain them. Laia is a Scholar slave, the lowest of the low in the ranks of the Martial Empire is fighting to find her brother and break him out of prison. Elias is a Mask, a warrior who has known nothing other than fighting and training as an empire soldier since age six. Two completely different lives yet the both only long for freedom from this world which is filled with violence and uncertainty. Both live in fear and both want to change the world. Elias wants people treated equal but lives in fear that he will be discovered deserting and will be killed. Laia just wants to survive her time as a servant under the watchful and terrifying eye of the Commander. Death is a possibility for her every day and the Commander is merciless. Yet Laia tries to get information to the Resistance in order to gain her brother’s freedom. But when Laia and Elias meet, worlds collide. Both are guarded against each other yet are yearning to find out more about the other. Especially when they discover they have the same views. But to let people know they know each other is almost certain death and they both have something much bigger to survive. This is an edge of your seat book in a world determined to crush all those who don’t follow the rules. You will be amazed at Laia and Elias’s will to survive and the trials they will overcome. The world and the characters are realistic and moving. Not a book to be overlooked and an amazing production for a debut author. A Court of Thorns and Roses by Sarah J. Maas is a dark fantasy woven together with elements from Beauty and the Beast and Tam Lin. Feyre, a human, is carried off by a monstrous creature the night after she killed a large wolf in t he forest. According to a treaty between faeries and humans, she owes her life to the faeries after having killed one of their own. Her captor, Tamlin, spares her but takes her to live on his estate in the faerie realm of Prythian. Tamlin, a shapeshifter and one of the High Fae, provides Feyre every sort of comfort with the understanding that she will not leave. During her stay, she begins to learn of a blight, a magical sickness, that has infected Prythian lands and weakened the powers of the faerie rulers. As Feyre’s loathing of Tamlin evolves into desire and affection, she becomes determined to help fight against the evilness that threatens Prythian and the mortal lands. Elizabeth Wein’s historical fiction novel, Black Dove, White Raven, is primarily set in 1930s Ethiopia. Through journal entries, stories, and flight logs, the novel tells the story of Emilia and Teo. Although not related by blood, they grow up as sister and brother as they travel throughout 1920s America with their stunt pilot mothers, the White Raven and the Black Dove. Teo’s mother, Delia, dreams of moving to Ethiopia to raise her son in a land where he will not face discrimination for the color of his skin. After Delia is killed in a plane accident, Emilia’s mother immigrates to Ethiopia with the children. Their peaceful lives on a cooperative coffee farm are interrupted by the threat of an Italian invasion, and Ethiopia, the only African nation to have not been colonized, finds itself at war. Separated, Emilia, Teo, and Momma must each play a role to defend the country they call home and find one another. A Court of Thorns and Roses is an engaging story, but not without faults. I found the lyrical descriptions of the faerie world to be a bit much at times to the point of distracting me from the plot. I also thought the effects of the magical blight were inconsistent. Even with his limited powers, Tamlin was able to shapeshift, make items appear and disappear at will, and create illusions. However, he could not remove masquerade masks from his face and those of his court (the image of which I found quite amusing and not beautiful and romantic as M aas probably intended). Finally, as I read, I continually questioned the motivations of the characters and their unnatural actions, particularly Tamlin’s. Why did he spare Feyre’s life and treat her so well when she had killed his friend? Why did he divulge so many private concerns when he barely knew her? Explanations of the characters’ motivations finally made an appearance two-thirds of the way through the book and redeemed my faith in the story. I had previously read Black Dove, White Raven and was not particularly eager to pick it up again. Although it is well-written and covers a piece of little known history, I did not find it gripping. I typically enjoy historical fiction, but I did not connect with the characters enough to care about them. Also, I did not find any distinction between Emilia’s and Teo’s voices, both of whom take turns narrating the story through their entries and logs. The two books I read were drastically different, in genre, writing style, tone, and so much more. Although I would say Black Dove, White Raven has a higher literary value than A Court of Thorns and Roses, teens (and I) are more likely to devour a decently-written, yet engaging, story than a well-written one that does not interest the reader. Black Dove, White Raven is not without value, but because A Court of Thorns and Roses is, in my opinion, more appealing, I determine it to be the winner! The Scorpion Rules is set in a world where climate change has nations warring over water. Talis, the keeper of the “peace” turns to an ancient method for forcing nations to be civil to each other. Sons and daughters of world leaders are raised together in Prefectures, where they go to school, farm the land, and live with the constant knowledge that if their parent declares war on another country they will be killed. Greta is the Duchess of Halifax and Crown Princess of the Pan Polar Confederation, a “child of peace” held hostage in the Prefecture. Greta is dignified and restrained. She is a leader amongst her peers and knows the importance of following rules. Enter Elias. Due to a newly declared war in the former United States, Elias becomes a child of peace as a rebellious teen. Elias ignores the rules, endures punishment for breaking those rules and continually pushes the boundaries in the Prefecture. This fractures Greta’s world a little bit. She begins to question her role in this elaborate system and discovers truths about herself and her world that change everything and lead her to make a startling sacrifice. The Red Queen is set in Norta, a kingdom where society is divided by blood type. Silvers are on top. They rule the world and everyone else in it. Their silver blood gives them super powers that they use to control water and fire and even get inside other people’s heads. Reds are born either to serve the Silvers, or to fight their wars. Mare Barrow is a Red. She is a skilled pickpocket who ends up working inside the king’s castle where she unlocks a power she did not know she had. Mare has the power to control lightening even though her blood runs red. If one drop of her blood is seen it could topple the Silver Empire. To cover up the truth, the king forces Mare to play the role of a long lost Silver princess and betroths her to one of his sons. Mare takes this opportunity to work as an insider with the Red rebel group, the Scarlet Guard, and learns that she has more enemies and more allies than she thought she did in her fight for justice. The verdict…..So, let’s start with full disclosure. Of all the books I could have been given to review, The Scorpion Rules had me excited in a way that no other book ever has. Not only am I married to a Canadian, I’m married to a Canadian who is from Halifax, and I spent two wonderful (albeit broke and chilly) years living there. Each time Halifax was mentioned it added a little spark of excitement to the story. I read those passages aloud to my husband and had fun talks with my daughters (who spend their summers in Halifax with their grandparents) about where the castle would be located (Citadel Hill is what we decided, in case you are wondering). I LOVED that. But I promise, it didn’t sway my verdict, just added to the fun. While The Red Queen seems more familiar, with themes that have been played out before, it was done so well that I thoroughly enjoyed it. The Red Queen was a bit of a slow burn that started quiet and then ramped up, didn’t stop and then ended with a wonderfully wicked twist. The Scorpion Rules had me engrossed at the start. Erin Bow’s storytelling and world building are outstanding, but the story got a bit buried in the details and it couldn’t quite hold my attention at the end. I think that, in this dystopian death match, the best way to pick a winner is to consider which sequel I will be more compelled to read, and that book hands down is The Red Queen. There has been quite a few interesting match-ups over the course of this tournament, but I think this one might be one of the most diverse. Here I am…trying to choose between The Winner’s Curse by Marie Rutkoski and Gabi, A Girl in Pieces by Isobel Quintero. I thought for quite some time about some kind of link between both of these stories and while one is a realistic fiction book written in journal form and the other is a fantasy thriller. I finally found a common ground. If there’s one thing that a majority of teens can always commiserate about, it’s parents. Gabi and Kestrel could sit down and grab some coffee and talk for hours about how Gabi’s mom is constantly telling her she’s too American and will never get a man while Kestrel could unload the whole situation involving her father’s dream that she follow in his footsteps and choose a life in the military. It was this realization that helped me organize my thoughts a bit. I’m not going to take the time to fully summarize the plot of either of these books. If you have been following the tournament, I’m sure you have an idea what the stories are about. 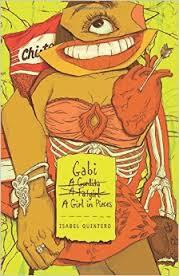 In short, Gabi, A Girl in Pieces is the journal of a Mexican-American high school senior who is dealing with a plethora of monumental issues in the lives of her loved ones including teen pregnancy, coming out to your family, and meth addiction. Gabi uses her journal to organize her thoughts and emotions while uncovering her own identity through poetry. The Winner’s Curse is a thriller set in a world where the Valorians have successfully the Herrani people who are now employed as slaves. Kestrel, daughter of a high-ranking Valorian general, makes a spontaneous purchase at a slave auction which furthers her empathy for the Herrani people. With an uprising looming, Kestrel’s new relationship with Arin may sway on which side she plants her loyalty. This is not an easy decision for me as I did not truly love either of these books. I enjoyed them both and will definitely recommend them to others, but neither left me wishing the book just a bit longer. I feel most people have already decided that Gabi, A Girl is Pieces will move on to the next round, but I’m not quite ready to set The Winner’s Curse on the back burner. Gabi started out slow for me. At first I thought it was an average book about a teen girl dealing with the same problems in every book. While that’s true, Quintero managed to grab me when I least expected it. Soon I could not stop reading the book. I read close to 3/4 of the book in one sitting. The connection was there and tears were flowing. 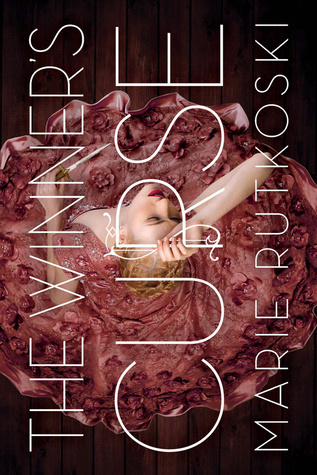 The Winner’s Curse is a much different book. Gabi depends on its readers making the emotional connection and falling into Gabi’s life story. The Winner’s Curse depends on the drama of the story to catch the reader. While Gabi took a while for me to latch to her story, Kestrel grabbed me immediately. Her character was more likeable from the get go. Unfortunately I found some problems in The Winner’s Curse as well. The whole story depends on Kestrel purchasing Arin. Even after finishing the book, I still don’t know why Kestrel would get sucked into the auction and bid on Arin. It’s so out of her character. While I enjoyed the story, I kept going back to that fact the entire time. I waited until the last minute to decide on a winner for this battle. I thought that maybe the answer would just appear to me in a dream sequence. Unfortunately I was not that lucky. I finally landed on a deciding factor. Gabi and Kestrel both have interesting stories. Out of the two, whose life would I want to continue experiencing? This may make me a bit unpopular, but I think that I have to choose The Winner’s Curse. Noggin by John Corey Whaley is a contemporary science fiction novel about Travis Ray Coates, who WAS dying of cancer. At age 16, Travis knows that his cancer is terminal. He doesn’t have much time, but when he is approached by Dr. Lloyd Saranson of the Saranson Center for Life Preservation, he is given an option. He can have his head cryogenically frozen until a time that it can be attached to a donor body. No one is sure it will work, until 5 years later, when Travis is “reanimated”. Travis is now a healthy 16 year old, but his friends and family have progressed through their 5 years. Nothing has changed for Travis, so he now has to figure out how to blend his 16 year old person into a world where everyone else has changed. When paths cross, strange things can happen. In Egg & Spoon by Gregory Maguire, the lives of Elena Rudina a peasant girl and Ekaterina Ivanovna de Robichaux a wealthy girl intermix when Ekaterina’s (Cat) train is delayed on the way to meet the Tsar’s godson. Cat is bringing a Faberge Egg to the Tsar as a gift, but when she shows it to Elena, she drops it off the train. As she goes after the egg, the train moves on with Elena in it. The two then have to figure out how to get back to their own lives and stories with mistaken identities. Their journeys involve the Russian folk tales of Baba Yaga, The Firebird and the Ice dragon come to life. Unbeknownst to them, this journey helps them save all of Russia. Egg & Spoon is part historical fiction, part fairy tale, part fantasy and part confusing. The story and imagery is amazing, but the author has a tendency to assume that the reader is already knowledgeable about the Russian folktales as well as writing at a very high comprehension level.